Flying Termites are attracted to light, which makes our homes the perfect target when conditions are right. Fly screens are your best defense however termites can still fly in under roof tiles and roof sheets to gain access to the home. Here are the facts! These flying termites are on their ‘Colonising Flight’ and are seeking a prime place to nest. Most of these insects will die within a few days, however a select few will find a mate and begin to start a colony, in stumps, in trees or inside the wall or roof cavities. These Termites are actively looking for moist conditions, which is why showers, bathrooms and laundry areas are perfect nesting locations. Flying termites are attracted to light. 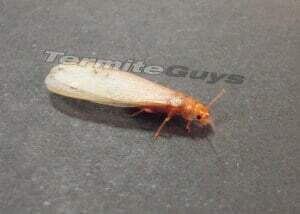 Most termite attacks occur from termites gaining entry into the building through underground trails however it is not uncommon for termites to start a nest inside the home without requiring access to the ground. Areas of high moisture such as shower and plumbing leaks, roof leaks, rotting timber, mould and water damage could provide termites with suitable conditions to survive without having access to the ground. Flying termites will often drop their wings when they find suitable conditions which is why you may also find just wings or just Termite bodies in and around your home. 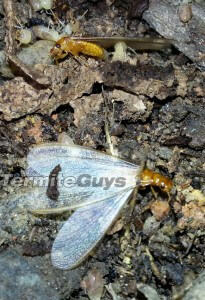 You will see in the first photo that flying termites (alates) have 4 wings which are the same size. This is the easiest way for you to determine if they are termites, otherwise you can send us a photo with your smartphone or email us. What can you do if you find flying termites in and around your home? 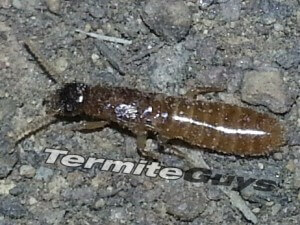 Don’t panic, there is not a lot that you can do to stop swarming termites but accept that this is an indication that a termite nest is established in close proximity to your home or occasionally inside the home and it is wise to talk to a Termite Guy for advice on inspecting your home for termites with an infrared camera. We can also check to see if there is any Termite protection in place. Most household fly sprays will kill any live flying termites that you find however this is unlikely to fix the problem. 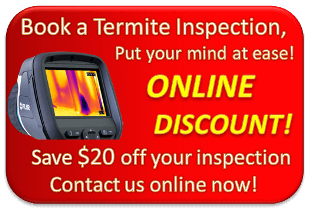 In most cases, when you find termites it is best not to disturb them and call us first so that we can provide you with the right advice for your situation. We take calls from 7am until 10pm. I’ll be up, so please don’t hesitate to call if you are concerned about something that you have found and it just can’t wait until the morning. I know the feeling! Turning off lights may help to deter some of the swarm as they are attracted to light. Close all fly screens and if you are finding them coming from inside the home, try to locate where the termites are getting in or where most of the activity seems to be.